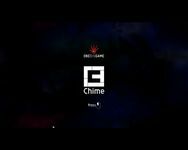 Chime is a block-dropping game that combines elements from both Lumines and Tetris. Players control a single shape at a time, and can move, rotate, and then place it onto a grid. A beatline moves across the grid in time with the music, setting off events when it hits placed shapes. Quads are created by placing shapes in solid blocks of 3x3 or more. When a quad is completed and the beat line hits, different musical samples are triggered dependent on its shape. The size of the quad denotes the score, and multipliers can be achieved by having several quads on the screen at once. Once the beatline hits a completed quad, it is stamped down into the grid, earning the player coverage. The overall objective is to achieve 100% coverage to earn more time and score points. Source: Wikipedia, "Chime (video game)", available under the CC-BY-SA License.